PROPOSED: Developer WATPAC has proposed two twin residential towers situated in St Pauls Tce in the Fortitude Valley. The site is near Leighton’s now completed Green Square development. The proposed twin towers will be a two-staged construction process. The site which was amalgamated from three individual sites will undergo a large urban renewal and rejuvenation process. 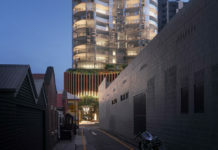 A green ‘garden-like’ public square will be constructed to connect pedestrian walkways together, syncing the project in harmony with the Valley precinct. The height of the two proposed towers is around 31 stories high, this height will allow for increased public ground space. The higher the tower, the denser it becomes. 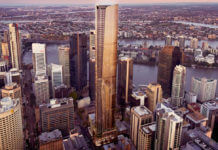 Density is the key to maintaining Brisbane’s current lifestyle, without expanding the city’s fringe outwards and reducing future demands for new road infrastructure. Designed by Nettleton Tribe who also crafted Skyline Apartments, this development will house approximately 412 apartments. In order to truly achieve the now proclaimed “Australia’s new world city” status, the Brisbane City Council itself needs to fast track this development application and others like this in order to pave the way for a much needed greener and denser housing supply in Brisbane.